Doing my part to conserve water. Gorgeous Man left on Friday afternoon to spend the weekend presenting at a seminar in Durban. Saturday morning I woke up and as I was washing my hands noticed that the water coming out of the tap was slowing to a trickle and then stopped altogether. We are without water again. I raced around the house and drained all of the hot taps. If you ever lose water, there will always be a bit left in the pipes of your hot taps, as it is stored in your water heater, or geyzer as they say here. That gave me additional drinking water. The campus maintenance team came around with a water trailer later in the day and gave me some water so that we can flush toilets. This is my new high tech system. The little hand in the picture is very accurate. Even though it’s freezing, the water is a great temptation for a certain little miss who can now open every door in the house. The picture is not blurry, it’s raining. This is not for drinking, but for flushing toilets and washing dishes. 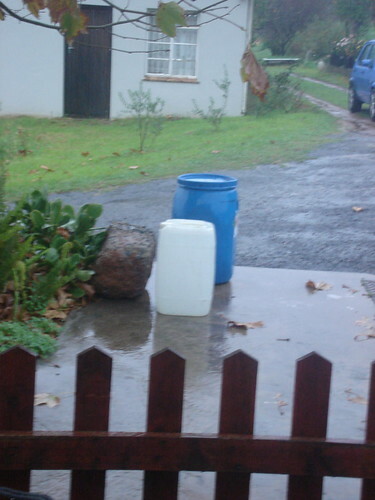 I’m waiting for the rain to stop so I can go out and collect some. I’m very good at conserving water. The kettle is boiled and a small amount of water is used to sterilize Gorgeous Girl’s bottle. Then the water is cooled a little and poured over a wash cloth (which is held over the sink to also rinse dishes) so that I can wash Gorgeous Girl’s face. I’m not happy about having to use disposibles all day, but cloth nappies are just not practical at this point in time. So, what’s a girl to do when she is on her own and can’t leave the house because she is unwashed? Well there was a bit of spinning, and some sewing on the fish quilt. Here’s a pic of my current leaders and enders project. 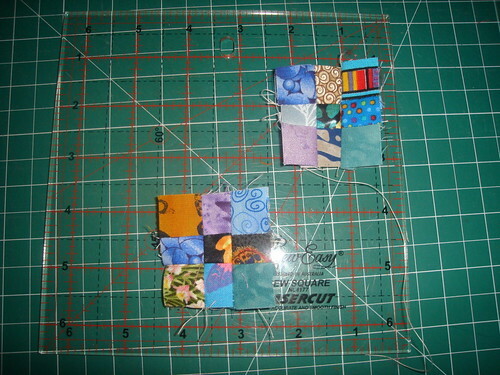 Nine-patches from 1″ cut squares. I am not matching them at all. They get sewn together in the order that I pull them from the scrap bucket. I only put one back if it is the same. I think I’m going to space them with 2″ squares, but haven’t decided if I’m going to use a single plain spacer or a scrappy patterned look. I’ve also been knitting. 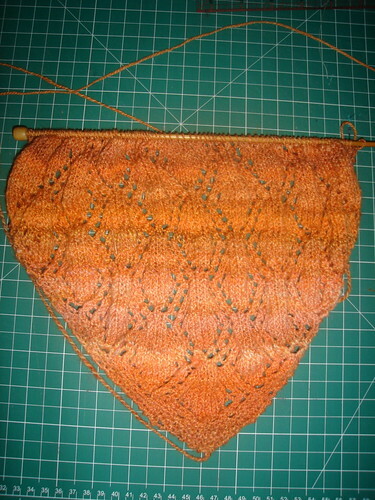 This is the beginning of juno regina in my orange handspun. It’s turning out reasonably well, not sure about the light section though. I hope that all of you have water. 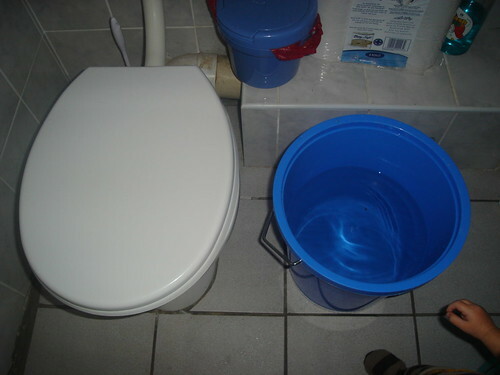 I swear, I will never take indoor plumbing for granted again. Just think, 20 more days and I’ll be back in Australia! For the last few weeks, I’ve been faxing and phoning and dealing with the South African Revenue Service (SARS) to convince them to let some boxes of bears from Sonnja into the country without charging us import duty on them. Karol-Ann and I were going to deliver them on Sonnja’s behalf to some sick children. The boxes finally arrived mere days before Karol-Ann was to return home. Here we are with all the bears. It was a very humbling experience to go and deliver them to one of the local childrens hospitals. A true reminder of how lucky we are and how precious health is. In crafty news, my Lace Ribbon scarf is finished. This yarn is very special. When I was pregnant with Gorgeous Girl in 2007, Gorgeous Man attended a conference in the USA and visited Washington DC to do some research. While in DC he took time out to find a yarn store for me and came home with 5 balls of this silk and 2 balls of sock yarn that were turned into a cardigan for the little one on the way. The silk I kept for me. 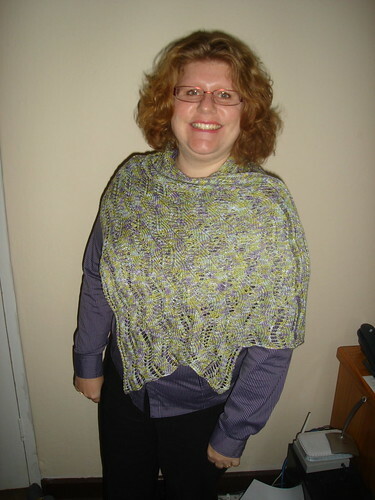 I looked for a pattern to do it justice for 2 years before finding this one. Here’s an action shot of the scarf in motion. I’ve got another scarf waiting to be blocked. Just need to find the time. Gorgeous Girl has a bit of a cold and just wants to spend all day sitting on my lap reading stories, so that’s not conducive to scarf blocking. Work on the fish quilt is continuing, but I won’t bore you with row by row shots. I should begin by reassuring you all that we do have water. It came back on 2 days after my last post, so we were waterless for 6 days in all. But I have water now and, as Gorgeous Man pointed out, at least this year we have electricity. as my design wall is the floor. Please forgive the dirty carpet. We are having some internal doors put in to the house (I’m trying to insulate the main living room a little better, and one of our bathroom doors didn’t close at all) and so there’s been boots tramping in and out all day. 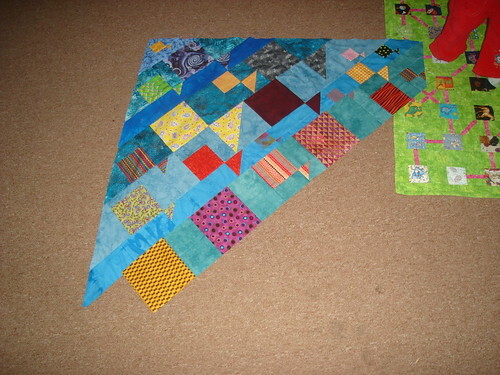 This quilt is turning out really fun, now that I’ve sorted out the mistakes I made with cutting etc. 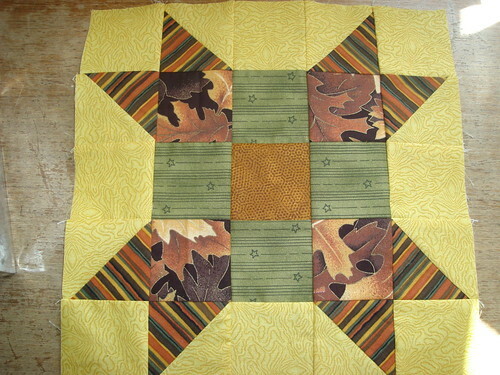 My leaders and enders project while I’m working on this quilt is sewing one inch blocks into nine patches. I haven’t worked out quite how I’m going to set them yet. But they are looking really cute. We had our Free Radicals meeting yesterday and I asked the ladies to save their scraps for me that they would otherwise throw out as being too small. The consensus was that I am insane. The group has decided that we are going to start the Dear Jane quilt. If a group of us are doing it then we will be able to get help from each other. I probably won’t start mine until I get back from Australia. I’m torn between making one out of blue shwe-shwe (South African indigo), batiks or reproductions. I think that the reproductions are going to be a little hard to source here though, so it will probably come down to the batiks (there are some fabulous locally produced batiks) or the shwe-shwe. Thoughts and opinions (and links to examples of DJ quilts) gratefully received. I have silk lace blocking as we speak. Now for it to dry… blocking in winter is never a good idea. The sun is shining and I’ve got the windows open so hopefully it won’t take too long. I’ve nearly finished a scarf from my green handspun. Pictures of that when it’s blocked and ready to go. I’m procrastinating knitting the thumbs on Kerin’s fingerless gloves. I’ll have to force myself to do that tonight and then I can pack them in the ‘personally carry the handknits to Australia’ bag. In other news, I had a weigh-in at the gym today. It must be miracle season. I haven’t been to the gym for a few weeks since we’ve had some car issues, but I’m down another 2 kilos (4.4 pounds). It’ll be good to get back into the swing of going everyday now that the car is sorted out. 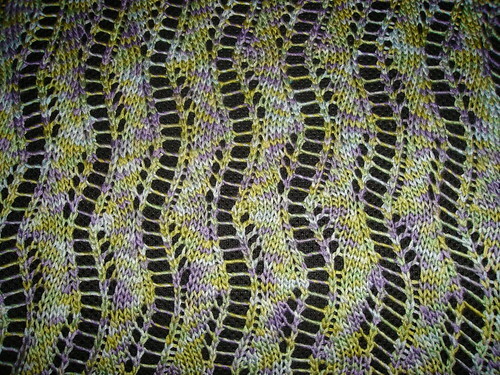 I would like to show you a picture of my ‘lace’ wrap all nicely blocked. I would like to show you a picture of my lovely new haircut. I would like to show you a picture of my lovely new glasses. But it takes water to block a scarf. I refuse to have my picture taken before my hair is washed and that takes water too. We have been without water for 4 days now. It comes on just often enough to flush toilets before they get too gross and sneak in the occasional lightening fast cold shower (have I mentioned it’s winter). It is expected that repairs to the pipes will be completed by tomorrow afternoon. Because we live at the very top of the hill it takes the longest for water to reach us, so I should have water again by tomorrow night. Gorgeous Man is going to fetch 10 or so litres from a tap that we have found that is functioning, so at least some of the dishes will get washed this evening. I think almost every dish we own is in the sink. I do have some quilting pictures to show though. These are my latest two blocks for the Free Radicals’ block exchange. The background is greener in real life. Just popping in to say that if you are knitting scarves for the Scarves for Africa project I’d appreciate it if you could get them in the post this week. Thank you. Leave me a comment if you need my postal address. The plan is to hand them over to Feeding Children in Africa in the first week of June. 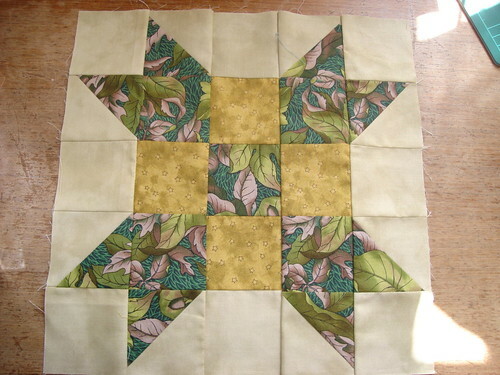 I’ll be back with some quilt blocks (more of that block exchange) and some spinning later. I’ve also finished some lace. I just need to sew in all the ends and block it.